Employees for BlackRock — the $6.3 trillion, multinational investment management firm — were given a treat on Wednesday afternoon as they left the company’s midtown office over the lunch hour. Few, however, stopped to read the packaging on the KIND bars the band of smiling environmentalists handed them. Perhaps they were saving them for later. Had they taken a closer look, they would probably notice something was a bit off on the granola bar’s familiar wrapping. “BlackRock is now the world’s biggest investor, but it’s got a big problem,” it read. The company made nearly $5 billion in 2017 and Barron’s has speculated that the firm’s founder and CEO, Larry Fink, is the “new conscience of Wall Street,” in part because of statements like this one, included in Fink’s annual open letter to fellow chief executives earlier this year: “To prosper over time, every company must not only deliver financial performance, but also show how it makes a positive contribution to society.” Fink is on the board of the Nature Conservancy and has advocated for investment strategies that promote sustainability and social well-being over the long term. So what’s so problematic about BlackRock? 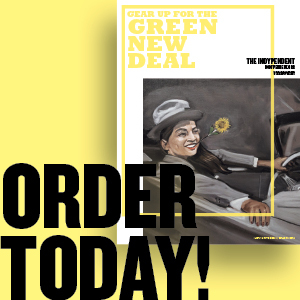 By the estimation of Friends of the Earth, Amazon Watch and the Sierra Club, BlackRock is the largest driver of climate change on the planet. On Wednesday, these environmental groups, together with the Australia-based Sunrise Project, launched a campaign to encourage the company to divest from its fossil fuel holdings. Since the 2008 financial crash, asset management firms such as BlackRock have taken over an increasing share of the global economy. Asset managers currently control about $90 trillion worth of capital worldwide, making them a powerful influence over global markets. One BlackRock portfolio, it’s “Global Allocation Fund,” contains a total of $1.94 in fossil fuel investments, according to the shareholder advocacy organization, As You Sow. It’s “Equity Dividend Fund” contains $3.62 billion, to offer another example among many. The company is the largest investor in new, coal-fired power plants in the developing world and has often used its position on the boards of companies it owns to push back against de-carbonization efforts. 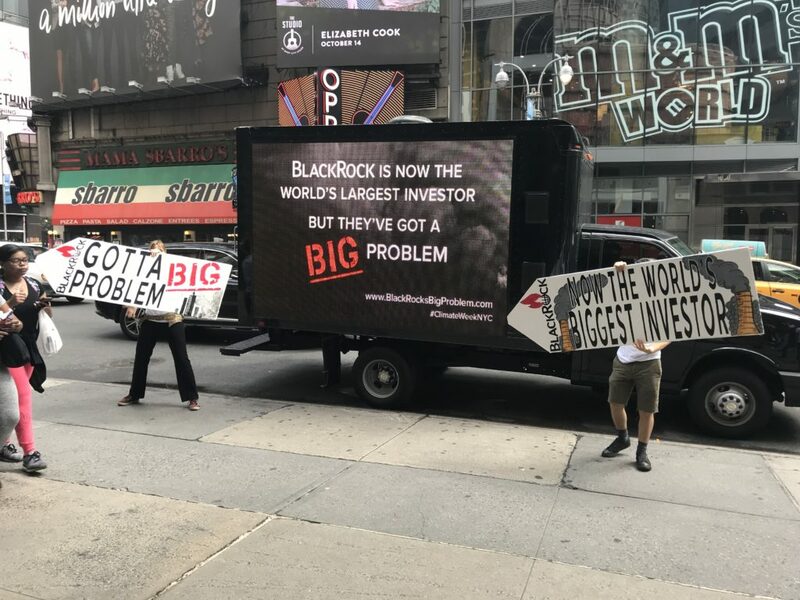 A mobile banner unit critical of BlackRock roved through Midtown on Wednesday, complete with a couple of sign twirlers in case anyone missed it. 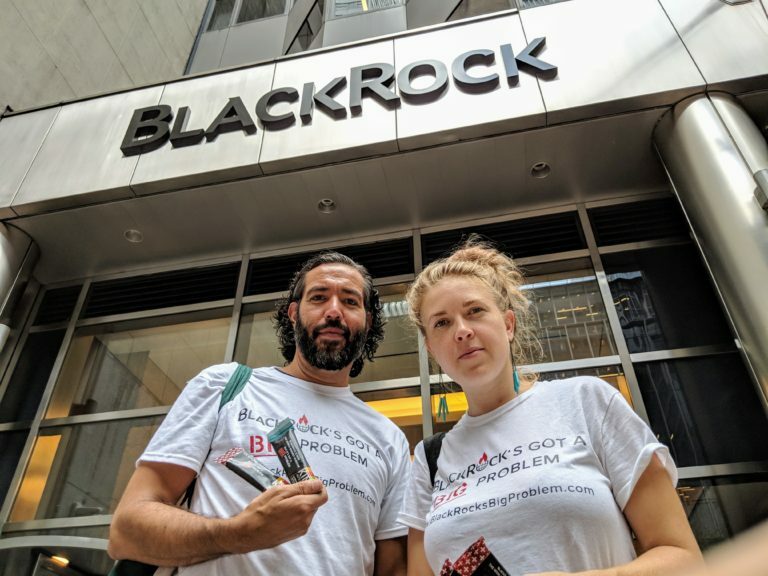 The BlackRock’s Big Problem campaign has three objectives: for BlackRock to divest from fossil fuel companies that won’t change their practices, to prioritize investments in fossil-free and deforestation-free funds and for it to use its shareholder influence to encourage the companies it owns a stake in to align their practices with the goals of the Paris climate accord. Defending the company’s environmental practices, BlackRock spokesperson Brian Beades told The Indypendent via email that it has “invested more in renewable power projects than virtually any other asset manager in the world and also is the largest provider of sustainable ETFs [Exchange Traded Funds], including the industry’s largest low-carbon ETF.” Beades said third-party index fund providers that “determine which companies to include in the indices they create” limit the investments available to BlackRock and its clients. 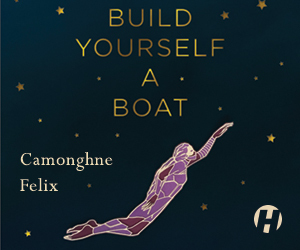 Environmentalists gave BlackRock employees something to read while they ate on Wednesday. “One person asked me if it would get them a free drink at the bar later,” McNeely recalled with a grin. The environmentalists hope their message will eventually start traveling up to the top once those KIND bars are unwrapped and those wristbands are examined, but, beyond its sustainable ETFs, there are signs Fink and BlackRock are responding to climate change. By the end of this year, all of the company’s U.S. offices will be powered by renewable energy. Pity for the planet the rest of the world won’t be. Photo (top): Kate McNeely and a fellow activist outside of BlackRock’s Midtown headquarters. All photos by Walter Hergt.